Reporting to the Board of Selectmen, the Conservation Commission is responsible for monitoring and leading efforts relative to conservation matters in the Town of New London. Develop the Town's trail system as an outdoor recreational resource. Hiking trail system development, maintenance, and signage associated with over 24 miles of hiking trails. Conservation easement targeting, development, and monitoring. Review and monitoring of projects and applications with environmental/conservation impacts. These include Wetlands Impact Applications and other projects which are deemed to be environmentally sensitive. Develop educational materials and programs. Develop and manage natural resources owned by the Town, including periodic forestry projects typically aimed at maintaining the health of the impacted forest and maintaining scenic views. By State statute, a Town Conservation Commission has 7 members and may have any additional number of alternates. Alternates attend meetings, contribute expertise to discussions, participate in supporting many Commission activities, and become voting members on Commission matters requiring a vote in the absence of a member. Members and alternates are appointed by and report to the Board of Selectmen for staggered terms of 3 years. Meetings are open to the public and held at the Town Offices. With infrequent exceptions, meetings are scheduled for 8:30 am on the third Wednesday of each month. A calendar reflecting the meeting schedule and meeting minutes are available on the Town of New London website. New London's Conservation Commission is dedicated to preserving, protecting and enhancing the town's natural resources, open spaces and scenic areas. Toward that end a strategic plan was developed to set goals for the Commission. A copy of the Strategic Plan can be found here. The Conservation Commission's efforts are supported through the efforts of many volunteers. Area residents are invited to contact any member of the conservation Commission to express an interest in being added to the list of volunteers supporting the Commission's efforts. 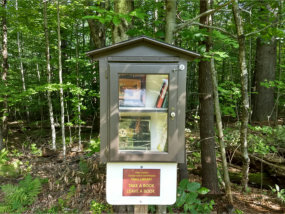 Conservation Commission members installed a library box at the Clark Lookout Trail for visitors to share books. Conservation Commission Chairman Bob Brown working on the bridge at the Low Plain trail dam. Mark Vernon and New London Hospital officials open the Hospital Community trail.